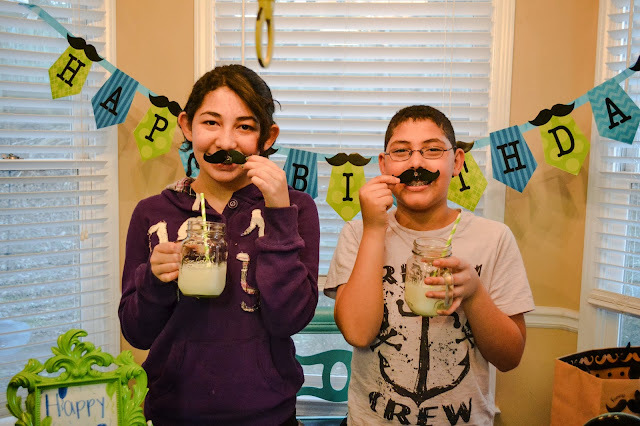 How to Throw The Best Kids' Birthday Party For Under $30 - Yes! It CAN be Done! Clever tricks to do your child's birthday party on the cheap! Kid's birthday party are our of control these days. Invitations, inflatables, party food, birthday cake, and decorations can really add up fast if you don't stick to a budget. Also, those freaking goodie bags that you spend so much time and thought that kids thrash straight out to the floor of your car is another money waster that you should try to avoid at all cost. 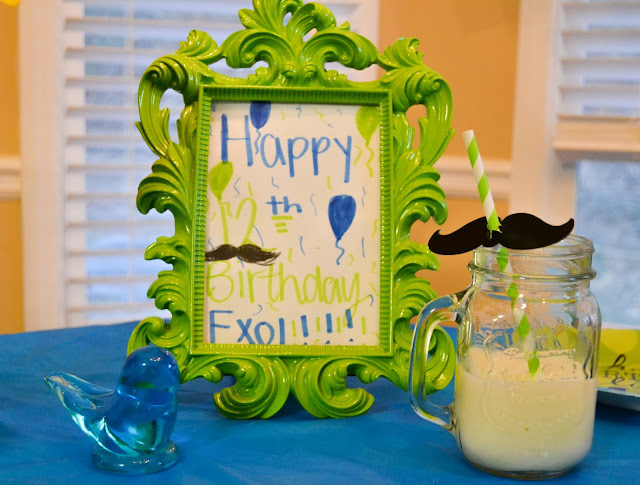 Sometimes parents are so caught up in creating the perfect birthday party that they check themselves out of the equation.The key to the perfect home party is to stick to your budget no matter how tiny it is, make it simple yet thoughtful, and use things around the house to decorate your birthday table. Don't go for a birthday theme, stick to a color combination instead. Why? Because at the end on the day color is what sets the mood of a party. Thinking about doing a Moroccan Party? Use different shades of purples and pink. A western theme party? Try shades of brown, ivory and plaid. What about a Mad Hatter Party? Use reds, white, and black and white stripes! The more you stick to your color combination the better the outcome will be. Decorations: Here's where you need to get creative. There are 4 things I always buy to decorate a party. 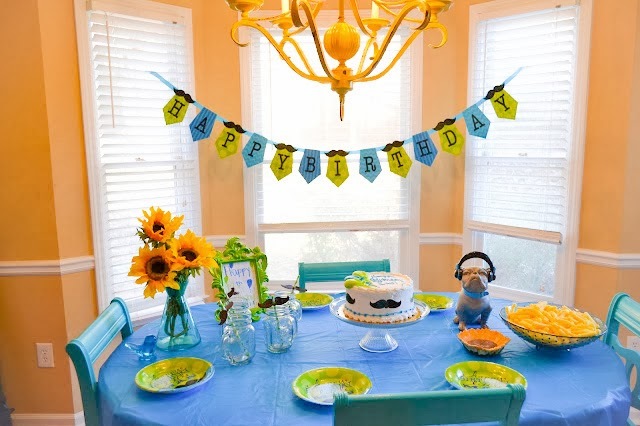 A birthday banner because it serves as a focal point ($3.99 at Hobby Lobby), birthday plates ($2.99 at Hobby Lobby), a tablecloth ($1.00 at the Dollar Store) and candles ($1.00 each at the Dollar Store). 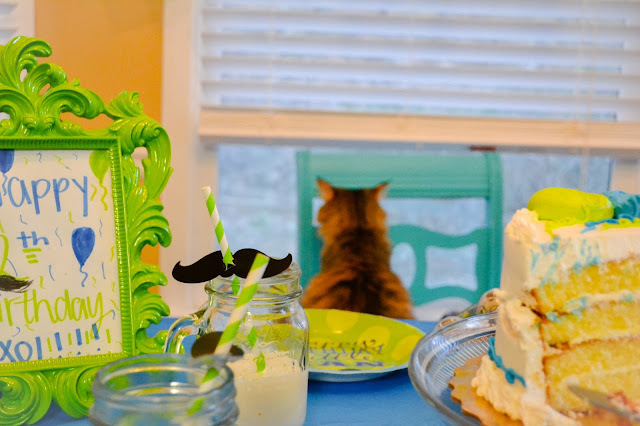 Because I had a little money extra I decided to plurge and buy those cute green striped straws and mustaches ($2.99 in total) to make the party colors more cohesive. Now for the rest, table decor, cups, etc, what I do is that I look for things that I already own to decorate. Notice the sunflowers, Bulldog, picture frame, mason jars and the Bluebird of Happiness ornament. Those are things I already own and that I'm repurposing for this event. Food: Here's what I do different. Instead of buying pizza, or unhealthy food I set the my dinning table as if it is Thanksgiving all over again. I cook a kid friendly dinner, sit together as a family, we pray and each person says one thing thing they're grateful about (in our case) the "birthday boy". This is when you as a parent check in, instead of out. Parents are so caught up trying to please everyone that they often neglect to take the time to connect with their children. At the end of the day, what kids want is the reassurance that they are loved and appreciated by their family. Is the simplest things that make them the happiest. Entertainment: There are so many things you can do to make your party memorable. If you love the outdoors take the kids to their favorite park, if you love watching movies but can't spend $50 dollars in tickets rent a redbox movie and have a family movie night. If your kid loves playing video games and has been asking you for the longest time to sit down and play with them, this is the day you can't say no. The gift of your time and undiluted attention will always be the ultimate present. Creating an authentic connection with your children will bring you a deeper sense of happiness to your life. 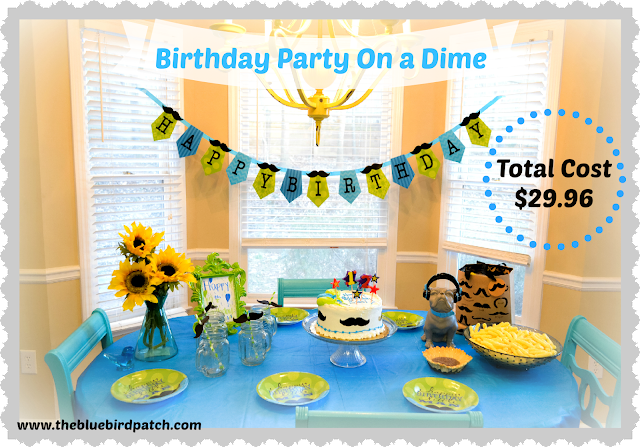 Have you ever throw a party on a tiny budget? What are your tricks to make it successful? Please tell us in the comment section below.